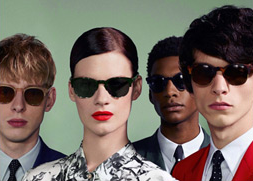 Designer sunglasses are made specifically to suit an individual face shape, hair colour and skin tone. The designers world is all about subtle colour and shape changes that elevate a basic shape into something quite stunning and desirable. 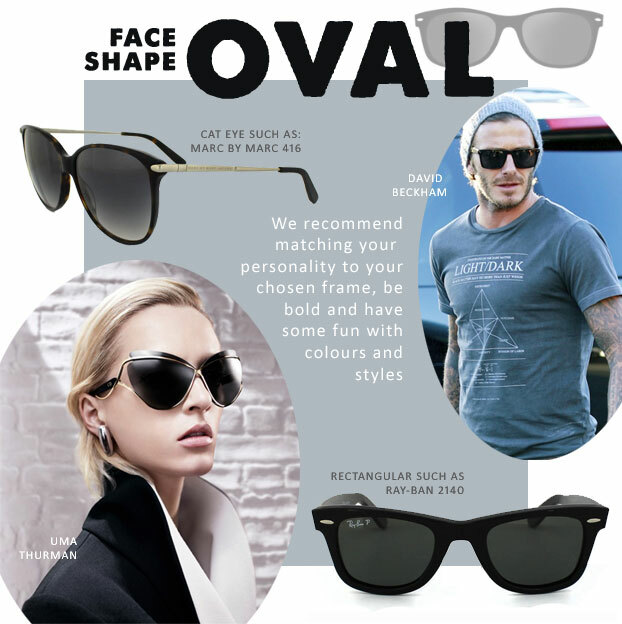 A great example is the ever popular aviator shaped sunglasses, this deep based lens looks heavy and dominating on most faces until you replace the solid lens tint with a gradient tint which instantly makes the lens look softer and less imposing. Such a subtle change is one of many features will are going to cover below to ensure you are armed with the correct information to make an informed purchasing decision. Start by working out what shaped face you have. This task is quite simply the most important part to buying sunglasses and frames effectively. Get this wrong and not only will you waste time and money but you will soon feel uncomfortable in your chosen eyewear only to repeat the process over and over. Take a selfie or choose a recent image or picture of your face flat-on so you can clearly define your face shape. We recommend discussing your shape with friends and family to ensure you identify the correct shape. Your choice must fall into one of the following shapes: oval, triangle, heart, round and square. Once you have the shape nailed you must consider other influencing factors such as your skin tone, hair colour and the core reason why you are looking to buy a pair of sunglasses. 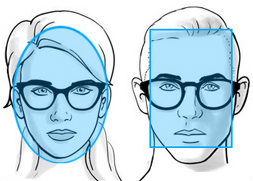 This last point 'why' is critical to identifying the correct brand of eyewear to buy. Designers generally work within strict remits and understanding why you are looking to purchase sunglasses will help reduce the search area. All too often we hear of people buying a frame with a bright colour or strange shape because friends influenced the purchase. Once home alone the reality of buying an expensive designer sunglass that will complement one of your outfits soon wears thin. Therefore, check the following four categories to help identify the brands that best service your needs. 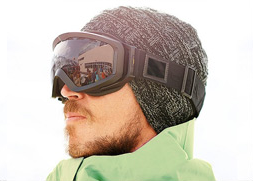 Sporting eyewear is big business and some of the world's most recognised brands are sport focussed. Many of these brands will be influenced by fashion trends but if this is your chosen category stick with them, the lens technology, frame design and product features provide the very best in sporting eyewear. Many brands will have also designed sunglasses for a specific sport, the most common sports that have been covered are fishing, running, cycling, shooting, skiing, athletics, tennis and driving. The most popular brands in the sunglass sporting arena are: Adidas, Arnette, Bolle, Cebe, Maui Jim, Nike, Oakley and Prada Sport. Probably the most popular reason for purchasing sunglasses. Most people own one pair of sunglasses and use them throughout the day so if you fall into this category you must ensure your purchased eyewear is versatile and robust. If this is your chosen category we advise base colours such as blacks and dark browns as these can be paired with most outfits and will look just equally at home with work attire or relaxing in your shorts on the beach. The following brands have a vast range of lifestyle sunglass models: Calvin Klein, Carrera, Emporio Armani, Fendi, Marc Jacobs, Maui Jim, Oakley, Police, Ray-Ban and Tag Heuer. If this is your chosen category then you can really have some fun! Designers love to push the boundaries with sunglasses and there are an amazing range of colour combinations, shapes and frame designs to explore. Designers such as Gucci and Dior develop key design-features that appear on bags, jewellery and sunglasses so you can really let your fashion streak run wild and mix and match accessories from collection to collection. The following brands feature heavily in the fashion sphere: Alexander McQueen, Boss, Chanel, Chloe, Dior, Fendi, Giorgio Armani, Gucci, Mont Blanc, Persol, Prada, Tom Ford, Valentino and Versace. With operations such as Cataracts becoming more popular the demand for quality lenses is on the rise. Only a quality sunglass lens will filter 100% UV so if your eyes have become susceptible to bright light and you want to avoid eye strain and headaches the following brands must be explored: Maui Jim and Serengeti. By now you know your face shape and the brands to concentrate your search on. Simply match your face shape below and shop the styles recommended to your shape. Congratulations, your face is the most versatile to fit! An oval face has slightly wider cheekbones and gently narrows towards the jaw and forehead. 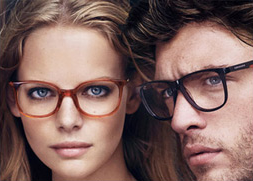 We recommend matching your personality to your chosen frame, be bold and have some fun with colours and styles. Fit: For the perfect fit look for the top of the frame to fit somewhere in the middle of your eyebrow line, if they completely cover your eyebrows they are too big for your face. Styles to shop: Aviator, Butterfly, Cat Eye, Oval, Rectangular, Round, Shield, Sport, Square, Supra (rimless) and Wrap. A triangle face is widest at the jaw and gradually narrows through to the forehead. This shape is not easy to dress correctly and those with a triangle face shape must look to sunglasses that are top-heavy to correct the balance. Styles to shop: Butterfly, Cat Eye and Supra (rimless). A heart face is widest at the forehead and gradually narrows through to the jaw. 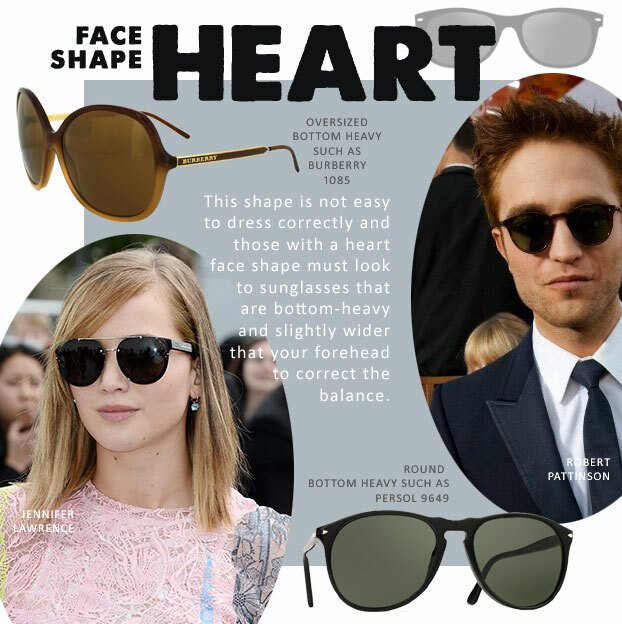 This shape is not easy to dress correctly and those with a heart face shape must look to sunglasses that are bottom-heavy and slightly wider that your forehead to correct the balance. Styles to shop: Aviator, Oval, Rectangular, Shield, Sport, Square and Wrap. A round face has an equally wide jaw and forehead coupled with soft angles. This shape is relatively easy to dress and those with a round face should look for a frame that gives bold, angular lines that sharpen your soft features. Fit: For the perfect fit look for the top of the frame to fit somewhere in the middle of your eyebrow line, if they completely cover your eyebrows they are too big for your face. Ensure the bottom of the frame hits just above your cheekbones. Styles to shop: Oval, Rectangular, Sport and Square. 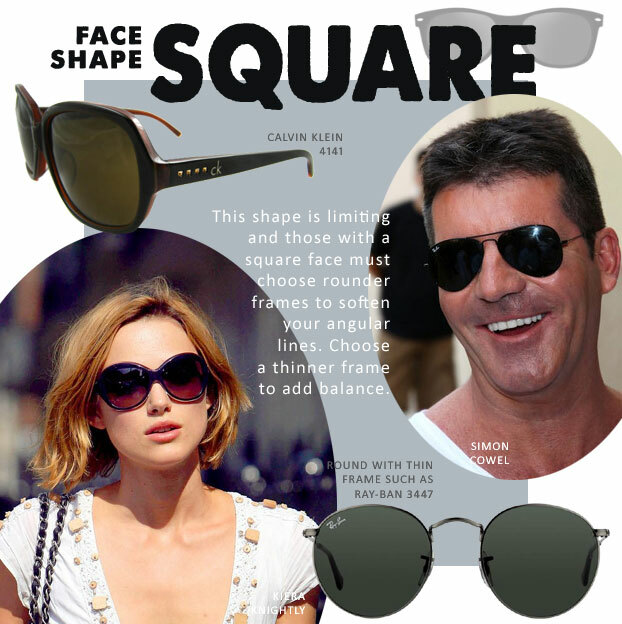 A square face has an equally wide jaw, forehead and wide cheekbones coupled with angular lines. This shape is limiting and those with a square face must choose rounder frames to soften your angular lines. Choose a thinner frame to add balance. Fit: For the perfect fit look for the top of the frame to fit somewhere in the middle of your eyebrow line, if they completely cover your eyebrows they are too big for your face. Ensure the width of the frame is slightly wider than your cheekbones. Styles to shop: Aviator, Cat Eye, Oval, Rectangular, Round and Sport.